If you’re after a coast-to-coast adventure, exploring WA’s south west is one of Australia’s dream road trips. It’s easy to see why. This picturesque route covers everything from coastal bush, turquoise beaches, historic towns and Karri forests. However, to experience all WA’s south west has to offer, you’ll need more than a week or two. Fortunately for those with limited time, we have put together an itinerary including some of our favourite highlights. See abundant wildlife and marine life, explore some of the world’s best beaches and sample wines, craft beers and local food. Whether you’re looking for a laid-back getaway or something more adventurous, WA’s south west has something for everyone. Pack your bags and let’s escape on your Perth to Esperance drive. View the full road trip itinerary at https://summerstar.com.au/blog. Eagle Bay is a coastal town only minutes’ drive from Dunsborough and Yallingup and an easy three-hour drive from Perth city. However, be prepared to add more time to your schedule to cater for stops along the way. Bunbury Dolphin Centre: Get up close and personal with bottlenose dolphins in Koombana bay. Busselton Jetty: The longest jetty in the southern hemisphere. Dunsborough: Cape Naturaliste lighthouse and the famous Dunsborough bakery. Eagle Bay Brewery: The perfect blend of rural and coastal views, this brewery is renowned for its craft beers, quality wine and food. Meelup Beach: Arguably one of WA’s best swimming spots with plenty of shade and pretty coastal walks. Follow the coast through Gracetown into Margaret River - WA’s surf and gourmet escape. Think undulating vineyards, lush forests, walking trails and some of the country’s best surf breaks. Day adventures in Margaret River’s centre include bustling shops, cafes and boutique galleries. At night, the town comes alive with a different scene of food, wine bars and live music. The Wilyabrup Sea Cliffs: WA’s wild, rugged coastline and rocky hills with breathtaking views. Look out for whales during spring and summer migration season. Gracetown Beach: Famous for its world-class surf breaks. Head to North Point for more of a challenge or South Point for a less heavy swell. Margaret River Wine Estates: There’s over 150 cellar doors to choose from in the area. Discovery Co. Tour: Take a canoeing tour along Margaret River. Hamelin Bay’s Historic Jetty: Watch the stingrays and snorkel the nine submerged wrecks in the bay. Stop over for a few nights at our Margaret River Tourist Park, close to the beach and other tourist hot-spots. Choose from holiday units, cabins, cottages, ensuite camping sites or powered and unpowered camping sites. Drive inland via Vasse Highway into Pemberton to discover the town’s timber heritage and experience charming streetscapes. The region is renowned for its enchanting forests with Karri trees more than 300 years old. Fun fact: these trees were originally used as fire lookouts in the 1930’s. You can extend this leg of the road trip by venturing inland from Pemberton to explore Diamond Tree, Manjimup and the Karri Forests. Karri Trees: There are three fire lookout trees remaining in Pemberton to climb. The Gloucester tree is over 60 metres high with 360-degree views – not for the faint hearted! Beedelup Falls: Follow the walk trail in Beedelup National Park. The suspension bridge hangs over the falls to give you an impressive view. The Cascades: Rocky rapids nestled in the karri forest off Northcliffe Road. Yeagerup Dunes: Sandboard or 4WD amongst the dunes. Head back towards the coast to Walpole from Pemberton, weaving through the forests and exploring wildlife trails along the way. Walpole is a tourist and local attraction famous for its beaches, rivers and waterways, diverse wilderness and scenic drives. Walpole-Nornalup National Park: Walk the Valley of Giants Treetop walk to experience the sheer size of the ancient trees. Fernhook Falls: Along the Deep River in the Mount Frankland National Park, these falls make a popular swimming and picnic spot. Don’t forget your camera to capture the views. Circular Pool: A large, tranquil freshwater pool surrounded by wilderness. Giant Tingle Tree: A giant fire-hollowed red tingle tree opposite Knoll Drive. Book a few nights at the Walpole Rest Point Caravan Park in the heart of Walpole. Our tourist park staff can organise any local tours or adventures for you as well. This route brings you back down towards the coast into Albany – the first settlement spot in WA. Hikes are well-catered for in this area as are the gourmet food and winery trails. Discover Albany’s maritime history, visit the local museums or take a short drive to Frenchman Bay to tour the old whaling station. Whale Watching Cruise: Watch the Humpback and Southern Right whales migrate in peak seasons. National ANZAC Centre: An award-winning tribute to the past and those who served, through interactive technology and historical artefacts. The wider Albany Heritage Park also incorporates Princes Royal Fortress, lookouts, Desert Mounted Corp Memorial and Avenue of Honour. Discovery Bay: Comprises Australia’s last operating whaling station, Australian wildlife park and regional wildflower garden. Torndirrup National Park: Carved out over time by the crashing waves to create an impressive 25 metre ‘gap’, now a popular lookout spot. The longest drive along the route follows the outskirts of Fitzgerald River National Park into Ravensthorpe before you arrive at Hopetoun. Make sure you set off early for this one. Depart Albany via Porongurup National Park along Chester Pass Road. This drive is a favourite for native flora lovers with 750 native plant species found in the area. Wildflower enthusiasts are encouraged to visit Ravensthorpe in September for the flower show. Granite Sky Walk: A 670-metre-high walkway scaling Castle Rock granite outcrop with two lookouts over the south coast to Mt Gardner and Mt Manypeaks. Archer Drive Lookout: For breathtaking mountain and farmland views. Fitzgerald National Park: This is one of the largest and most botanically significant national parks in Australia with more than 20 per cent of all WA’s flora species and diverse native fauna found within its boundaries. Southern Ocean Road: Head east of Hopetoun to access coastal lookouts and secluded swimming spots, including Mason Bay and Starvation Bay. Esperance is a haven for unspoiled beaches and extensive national parks. Take the National Route for the drive. When you get there, the best way to explore is with a 4WD, as many of the beaches are open to drivers with designated 4WD tracks that meander through National Parks. Here, you’ll also be able to witness the whitest beach sand in Australia at Lucky Bay, arguably Esperance’s biggest drawcard. Pink Lake: Best viewed from the Pink Lake Lookout, this body of water is stained pink because of high concentration of algae and salt. Recherche Archipelago: Here You’ll find fur seals, sea eagles and be able to access boat cruises. Condingup Tavern: A character-filled local country pub made from dark stone and wood. Esperance Museum: Check out the Skylab exhibit and local art and craft outlets nearby. Stonehenge: Outside the remote coastal town of Esperance is the world’s only full-size replica, made from local pink granite. 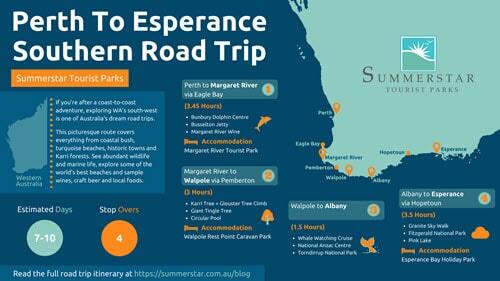 It’s easy to spend a week in Esperance with the amount of attractions and things to do. Stay at our Esperance Bay Holiday Park, which has multiple accommodation options to suit all travellers. Driving from Perth through WA’s south west is a relatively straightforward drive. However, if you like to explore, it’s easy to stay more than a night at the stopovers listed on our itinerary. Although the mentioned times are accurate according to Google Maps, this road trip can take days or weeks, depending on how long you choose to stay at a location or whether you get side-tracked with other adventures. After all, it’s often the stops along the way that make for a satisfying adventure. If you're planning a trip up the northern corridor of Western Australia, be sure to check out our Ultimate Road Trip Along the Coral Coast. For more travel tips or accommodation information, contact us to see how we can help you plan your next adventure.